In the last post I mentioned that the cradle was originally used in Spirit Book #79. It was replaced by this one that was a gift from artist Merike Van Zanten from her lakeside home and studio in Maine. It was one of a few armfuls of pieces that she delivered to my door last year. The acorns were gathered in Stoneham, MA by Thomas Lane and his mother Christina. 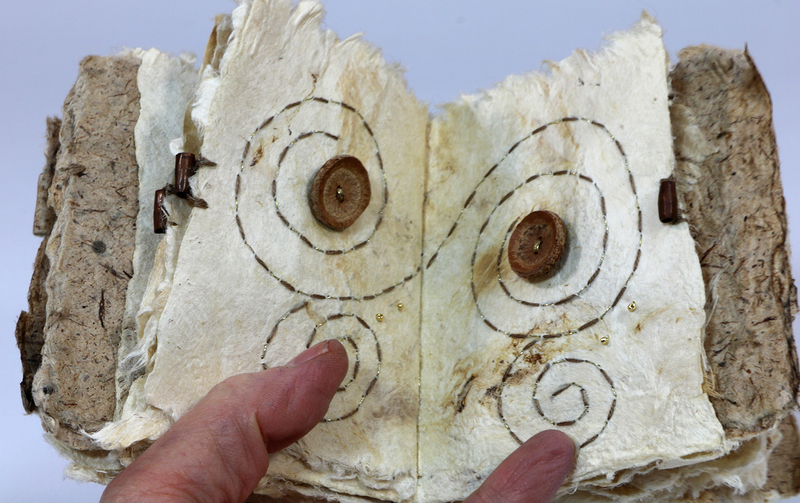 I trimmed the edges to make flattish buttons which were sewn to the pages with gold metallic thread. The spirals are stitched with thread and copper beads are sewn on the edges of the pages. The paper is amate paper from Mexico. It is one of my favorites. I love its color, texture, and history. It was the paper made by the Mayans and Aztecs from the inner bark of the fig tree and is made by hand the same way today. You can view a video of the papermaking process filmed in San Pablito by Eliza Holliday here. The darker paper is Shawa paper from Bhutan. 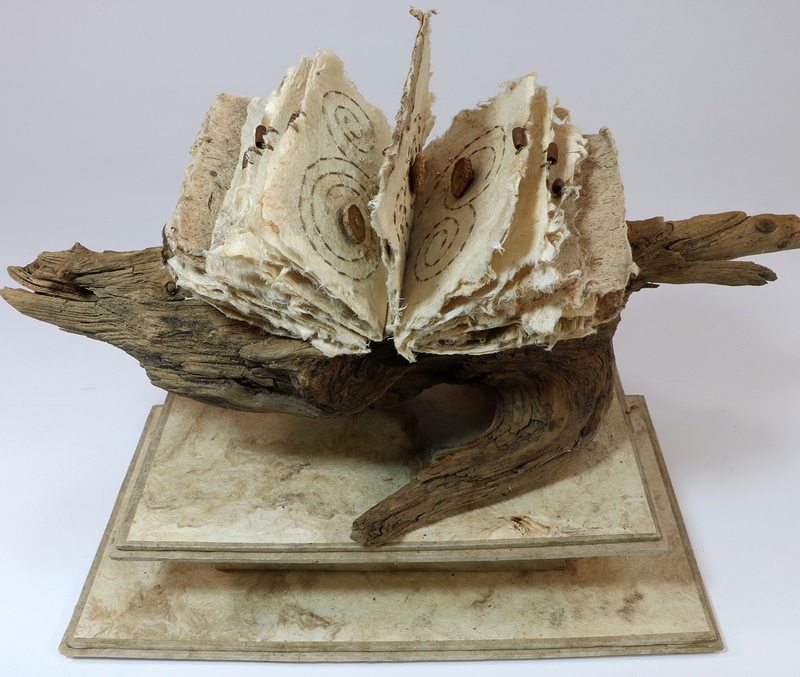 The book is named Enduring Benevolence because both the cradle and the acorns on the pages were gifts. Enduring comes from the acorns. Oaks are symbols of longevity and endurance. The Spirit Books are on view at the Hunnewell Building Visitor Center at the Arnold Arboretum of Harvard University until July 22. Gallery hours are 10 AM-5 PM everyday but Wednesday.